The blood donation campaign “Red Sunday” was held at 70 places in various localities nationwide on January 13, aiming to collect about 50,000 blood units. Bangladesh went to the polls on Sunday after violence-plagued campaigning, with Prime Minister Sheikh Hasina seeking a third straight term in a face-off against an opposition whose leader is in jail on what she says are trumped up charges. PSNews - The Traffic Police Force across the country will wage a major campaign to ensure traffic order and safety and social order. The campaign will start from December 16 through to the upcoming New Year, Lunar New Year (Tet) and spring festivals. The Ministry of Public Security (MPS) launched many campaigns to crack down on crimes in the first half of 2018, thus uncovering a number of transnational drug trafficking rings, MPS Minister Sen. Lt. Gen. To Lam said on July 2. PSNews – The People’s Police Academy (PPA) on June 11 launched the 2018 summer voluntary campaign. U.S. President Donald Trump demanded on Twitter on Sunday that the Justice Department look into whether his 2016 presidential campaign was infiltrated or surveilled by the agency or the FBI under the Obama administration. The Ministry of Public Security (MPS) on March 27 organized a teleconference to review task performance of the whole Public Security Forces in the first quarter of 2018 (Q1) and the intensive campaign to ensure security and suppress criminal activities during the Traditional Lunar New Year festival (Tet). The Earth Hour campaign 2018 will start at 8pm in Hanoi on March 3 with the slogan “Go more green”, according to the Ministry of Industry and Trade. PSNews – The Ninh Binh Provincial Police on January 11 organized a ceremony at the Cultural Center of Tam Diep city to launch a campaign to attack criminals and ensure security and order for the upcoming Lunar New Year. Deputy Prime Minister Truong Hoa Binh launched the Year of Traffic Safety 2018 during a ceremony in Hanoi on January 3. PSNews – The Hai Phong Municipal Police on January 1 launched a campaign to ensure security and order in the city for the New Year 2018. PSNews – The Quang Tri Provincial Police on December 18 kicked off an intensive campaign to suppress crimes and ensure security and order for the 2018 Traditional Lunar New Year Festival (or Tet). PSNews – The Can Tho Municipal Police organized a ceremony on December 13 to launch an intensive campaign to supress crimes, ensure security and order for the 2018 Traditional Lunar New Year Festival or Tet. 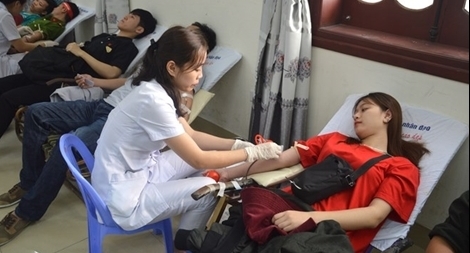 PSNews – A blood donation day was organized by the Ministry of Public Security and the Centre for Hematology and Blood Transfusion based in Hue, at the Dong Son Prison, Dong Hoi city, Quang Binh on November 11. PSNews – The Department of Traffic Police (under the Ministry of Public Security) organized a ceremony on October 15 to launch a campaign to ensure traffic order and safety during the APEC Summit 2017. PSNews-A Blood Donation Day was held in collaboration with the People’s Security University (PSU) the Ho Chi Minh City’s (HCMC) Hospital of Hematology and Blood Transfusion and Hospital 304 under the Ministry of Public Security (MPS) on September 17 in HCMC. Up to 21,000 people participated in a blood donation campaign jointly by the National Institute of Hematology and Blood Transfusion and Samsung Vietnam. Many roads and pavements in HCM City have again been encroached by illegal parking areas and street vendors after city authorities halted their campaign to clear the pavements four months ago. PSNews-In the morning of July 2nd, thousands of people in Ca Mau participated in the “Giot hong Dat Mui”(Blood donation in the Cape Land”, part of the nationwide blood donation campaign that runs thru various provinces all over Vietnam. PSNews-Throughout the campaign, the students will repair houses for the elderly, build rural roads and bridges, houses of gratitude, install street lights and offer gifts to needy families.